Situated in the highest reaches of the Pirin Mountains, Pirin National Park encompasses rugged alpine peaks that rise 8,202ft (2,500m) into the atmosphere with more than a hundred glacial lakes spread at their feet. The magnificent landscape is made up of old forests, waterfalls, caves and areas of limestone that are home to near-extinct flowers like the edelweiss and Pirin poppy. Boasting an abundance of rare and endemic species of plants and animals, this unique national park is listed as a UNESCO World Cultural and National Heritage Site. 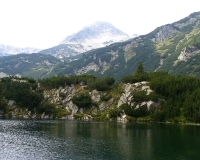 Alpine mountaineering and skiing are popular activities in Pirin, as is hiking. The park boasts numerous, well-maintained hiking trails which wind through stunning scenery. There are also little wooden huts with bunk beds for hikers to sleep in on the trails. The hiking trails are generally pleasantly uncrowded but if you want to spend the night in one of these rustic huts then it is best to book it in advance. The popularity of the park with outdoor enthusiasts, together with the cultural heritage of the surrounding mountain settlements and stunning scenery, make Pirin National Park an attractive tourist destination which usually rates highly on a Bulgarian travel itinerary.